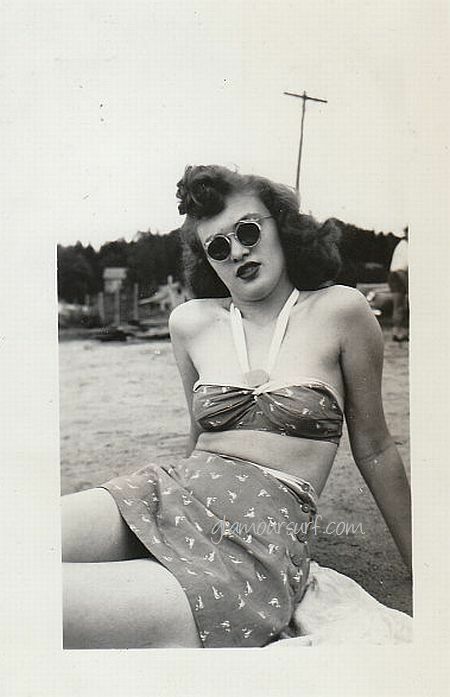 I have always loved this 1940s style of two piece swimwear. This sweet set consists of side buttoned bottoms with coordinating accent trim on waist and top. The halter was popular and this effortless version features a gathered band between the cups with the halter tying behind the neck. The top could be worn bandeau style as well with the straps undone for sunning. The coordinating band on the top is a fold over flap of material. The top would have either buttons or be tied at the back strap. Her round sunglasses and hairstyle complete her fabulousness. I would love to see what shoes or sandals she brought along with this cute beach set. I bet she'd be wearing espadrilles or a wedge sandal with a lot of straps.